Mario Kirner is the owner of the Friday the 13th Props Museum and was initially supposed to bring his prop collection to the United States for the now defunt Camp Blood 30th Anniversary Reunion that was to take place in August of 2010. Many fans were disappointed they missed the opportunity to see the props. Since that time, Mario has been working hard to showcase his collection at specific conventions and events closer to his home in Germany. 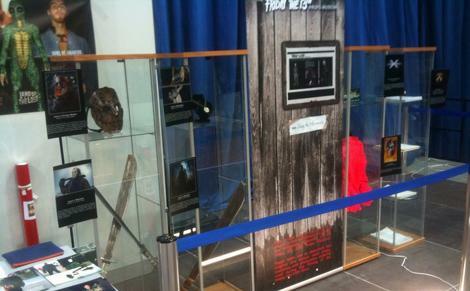 He last exhibited his props in Febraury at The Movie Event with Jason Voorhees actor Douglas Tait. Now, Mario is in negotiations to bring his prop collection to a new venue. Below is what he had to say about the negotiations. I`m in talks with the team of the Antwerp SciFi, Fantasy and Horror Convention, based in Belgium to bring some of my stuff over for you to see in 2012. They have an upcoming con this year in May but sadly the time and budget was a bit tight to get the Museum over this year. If you live in the area and would like to request a specific item for Mario to bring to the event, check out his website http://www.fridaythe13thprops.de/ to look through his collection and then either email him at info@fridaythe13thprops.de or leave your request in the comments below. Meanwhile, take a look at the awesome setup of the Friday the 13th props that Mario has created to display the histroical relics for the film franchise!